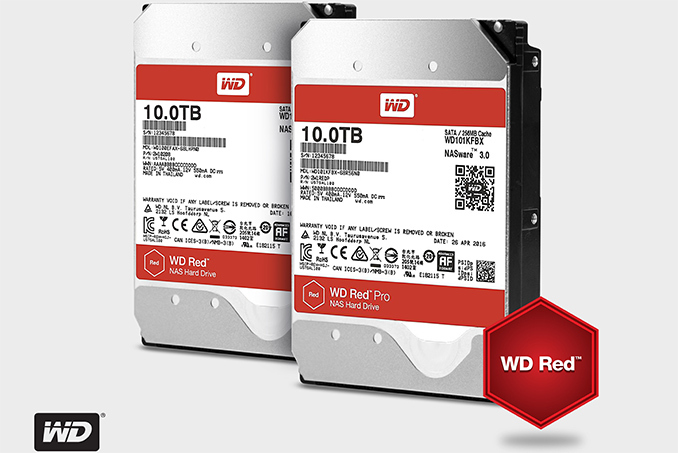 The WD Red 10 TB drive is engineered for personal or small business NAS systems with up to eight bays, is optimized for mixed workloads and has a 5400 RPM spindle speed. By contrast, the WD Red Pro 10 TB is aimed at medium business and enterprise-class NAS systems up to 16 bays, which is why the HDD features additional protection against vibrations as well as improved random read performance due to both 7200 RPM spindle speed and firmware tuning. Just like their predecessors, the new WD Red/WD Red Pro hard drives come with SATA 6 Gbps interface. 5x2TB RAID5 is a pretty brave decision. Near guaranteed URE? That's complete nonsense. I've done a bunch of testing myself and find nothing of this sort to be remotely true. I built a 10x2TB MD RAID 5 array, filled it with data and then kept removing a drive and rebuilding the array, then verifying all the data. I rebuilt it and verified it 20 times before I needed the disks for something else. I never came across a URE. I also have a 12x4TB ZFS pool that I scrub twice a month. ZFS notified you of UREs and repairs them when they are found. I've scrubbed my 70% filled pool more than 100 times with no URE encountered. "URE's are not as common as you apparently think they are." More to the point they're nowhere near as common as the specsheets imply they are. The specsheet numbers (unchanged for a decade or two despite all the capacity increases) imply a failure rate of once per ~12.5TB (100 terrabits); which would make RAIDs above a few terabytes a crapshoot to rebuild and ones a few times larger nearly impossible. The reddit post I've linked has some actual test run data from someone else whose results were the same as yours. Some of the replies, eg the one claiming that the average is dominated by much less frequent failure modes that generate large numbers of errors at once, are interesting as well. Either way the naive prediction of how big an array you can rebuild before being likely doomed by a URE is much too small. Rebuilding an array can fail today just like it could a decade or two ago; but the apocalyptic predictions from early this century never came to pass. I miss-wrote on my previous comment. All the datasheets that I have seen say < 1 in 10^14. The implication is there because there exist drives with the <1 in 10^15 (1 error per 1000TB) spec. Since these drives are not expected to be that reliable, the implication is that there is a reasonable chance of an error somewhere between 100TB and 1000TB for a drive rated <1 in 10^14. I think the error is a percent chance, which doesn't accumulate the same way as a "1 per xxTB written" would accumulate.